Who are our alumni, and what have they been up to? After graduation, Roy (B.S., '48) spent 45 years in the energy exploration trenches, traveling over the world for Shell Oil Co. and later his own consulting company. He felt blessed the whole time to have the chance to be a subsurface geologist. The GI bill brought many (WWII) veterans to school that otherwise couldn't afford it. We had free tuition, books and lab fees and were paid $65/month for single students and $110/month for married couples. We were a mixed group. Some of the veterans majoring in Geology were married, some took part-time jobs, some goofed off but most of us were serious students. All of my Geology and Paleontology courses were in the basement or on the first or second floor of Morrill Hall (now the Univ. of Nebr. State Museum). I took 15 to 17 hours a semester and went to summer school between my junior and senior years. I pledged to a fraternity and between lectures, homework and social life the years went by in a flash. Prof. Schramm was chairman of the Geology Dept. and taught courses in mineralogy, petrography, mining geology and petroleum geology. He had a broad background, having worked for the U.S. Geologic Survey, the U.S. Forestry Service, Chief Geologist for the Union Pacific Coal Company and geology and mining engineer for several oil and mining companies. His lectures covered not so much the technical aspects of his subjects as the kind of problems one dealt with working in industry. He delighted in telling stories and he liked to relate his experiences as a wildcatter in the Central Kansas Uplift in the '30s. Many discovery wells had been drilled and drilling rigs were hard to come by. He had a rig working in one of his fields and it was customary at the time to shut down at night. When he and his crew returned to his drillsite one morning they found the rig was gone. Someone had come with a truck, taken down the rig and transported it to another field. He had to buy another rig and after that he carried a shot gun in his truck and hired an overnight armed guard for his rig. He was short, bulky, nearly baldheaded and had a twinkle in his eye. We noticed that he always seemed to wear the same suit, a tan worsted wool suit, perfectly pressed. We learned that he had bought a tan, worsted wool suit and liked it so much that he had a dozen of them made. He was a bachelor and lived on the entire top floor of the Lincoln YMCA. He invested his money during the Great Depression in farms in Nebraska and Iowa and at one time had 23 farms. He had one bit of advice that he managed to work into every lecture; if you can make money for someone else you can quit and make money for yourself. He may not have been a great scientist but he was an unforgettable and inspiring character. Professor T. Mylan Stout was a true scientist. He taught stratigraphy but was well qualified to teach almost any geology or paleontology course. Of the faculty in the Geology Dept., he was the one I always went to with a question. His seminars were always inspirational and well attended. He was compulsive about his work. It was told that he was late to his wedding because he got occupied drawing a beaver skull and lost track of time. 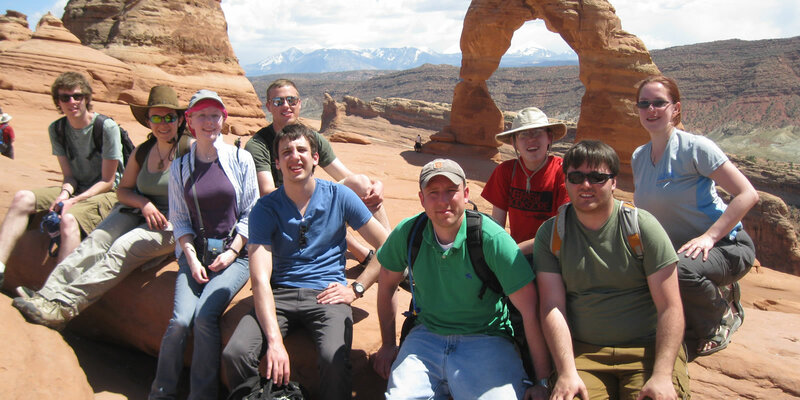 Prof. Stout led us on an unforgettable geological field trip through Kansas, Oklahoma, Texas and Arkansas. One of the first stops was an outcrop where we saw beautiful fossils that had weathered out of the host rock. Ground water had replaced the original organic forms with reddish-brown carnelian (a semi-precious quartz mineral). Each fossil was a real gem stone and we started stuffing them in our pockets. Prof. Stout intervened and told us that this was a protected site for paleontological study and made us empty our pockets. Near Marathon, west Texas, we spent a good bit of time examining the Early Paleozoic (350-550 million year-old) deep water deposits, called the Ouachita facies (dark shale, thin-bedded limestone and chert, all impermeable rocks) of the Ouchita Thrust Belt. The thrust belt consists of folded and faulted starta which extend from Mississippi through Arkansas and Oklahoma into Texas and Mexico. In eastern Oklahoma we again stopped at an outcrop of the thrust belt and found the same Ouachita deep water facies. Then, some 20 miles to the north we found the same age rocks to be light colored, shallow, water, porous and permeable limestone and thin shale beds, called the Arbuckle facies. Thus, we were able to picture the ancient continental shelf to the north and the continental slope and abyssal plains to the south. And we saw first-hand the surface expression of an orogenic (mountain-building) belt, the Ouachita Thrust Belt, along which the rocks had been thrust faulted and folded. We had a very long, hot day looking for fossil ammonites (a spiraled marine animal closely related to the squid) and found several small specimens. The largest and best preserved specimen was found by those of us that night looking for a beer; it was a stepping stone into a bar, but the proprietor wouldn't let us take it. Prof. Stout's running narrative brought stratigraphy and structural geology together in a manner that text books could never have done. Since then I have been on countless field trips but have never had quite the feeling of discovery that I had on that trip. Marlan was a former President of the AAPG, an elected Fellow of the American Associates for the Advancement of Science, a Senior Fellow of the Institute for the study of Earth and Man at SMU, and a fellow of the Geological Society of the United Kingdom. Marlan was knighted by President Biya of Cameroon for his service to that country. He was honored by the world’s largest geological society as “A Living Legend in the Oil and Gas Business” and was a distinguished lecturer for several geosciences organizations. Marlan had a thirty-year career with Shell Oil in management and research, retiring as President of Shell (Pecten) International in 1987. After a brief retirement during which he founded Roxanna Oil Company, he joined ARCO, serving as President of ARCO International for seven years. After retiring from ARCO, he became Bartell Professor of Geoscience at the University of Oklahoma, and Chief Scientist at the Sarkeys Energy Center. In 2000, he organized and chaired the Presidential Energy Policy Symposium in Washington, DC. In 2002, he received the R.H. Dott award for best geologic publication, and in 2003 he received the Hedberg Medal for outstanding scientific achievements. In 2005, he was honored as a “Legendary Oil Finder” by the Petroleum History Foundation. In 2008, Marlan received the Sidney Powers Memorial Award, the highest honor bestowed by the AAPG, for his outstanding contributions to oil and gas exploration. Marlan led exploration teams in 62 countries, has an extraordinary record of consistent successes in his sixty-year career and showed no signs of stopping. Mr. Downey earned a Bachelor of Arts degree in Chemistry in 1952 at Peru State. He entered graduate school at the University of Nebraska and received a Bachelor of Science degree in 1956 and a Masters degree in Geology in 1957. I grew up on a rocky farm in Cass County, where I became interested in geology at an early age. By the time I enrolled at the University of Nebraska in Lincoln, there was no question that I wanted to become a geologist. I graduated in 1963 with at B.S. in geology and went directly to graduate school, earning my Ph.D. from Johns Hopkins four years later. My professors at Nebraska, especially Sam Treves and T.M. Stout, set me on a career path in research. At Hopkins (that’s what we call it), Francis Pettijohn taught me how use sedimentary structures to reconstruct paleoenvironments and paleogeography. Ernst Cloos drilled us weekly in field techniques in structural geology, and Cliff Hopson taught us to write entire essays on a single thin section of igneous rock. My experiences at Nebraska and Hopkins prepared me for my lifetime job: field research in minerals and mapping at the U.S. Geological Survey. Few jobs could have been more rewarding. Early projects varied from tracing the source of placer gold in Tertiary alluvial fans while living in wilderness horse camps to mapping stratiform copper in the Belt rocks of Montana with a helicopter. Next came beryllium in volcanic rocks in the desert of western Utah. I had to teach myself volcanic processes, clay mineralogy and economic geology. Two years at headquarters in Reston, VA gave me a front-row seat to congressional hearings, the budget process, and working with other agencies--I called it “serving time in the big house.” Back in Denver, I mapped thrust sheets in Pennsylvanian redbeds in the Sangre de Cristo Mountains, researched uranium in volcanics, and travelled in the U.S. and Communist Poland to study sedimentary copper deposits. The price for all that fun was five more years behind the desk, but as director of a program of field surveys and minerals research, I enjoyed seeing some amazing research by other scientists. After that they turned me out to pasture, meaning I mapped beautiful and interesting places along the Rio Grande rift and studied gravel deposits of Pleistocene rivers. In retirement, I still volunteer for the USGS. Old geologists never really die. When you use our maps, listen for our footsteps: we are still out there mapping the mountains. Help us by sharing your success story with today’s students.